This machine holds two rolls of music so one can constantly play as the other is swapper or rewound. After fifteen years of painstaking research and work, Brian "Goatboy" Thornton of Short Mountain Music Works has completed restoration of his Wurlitzer 153 Caroussel Organ. The Organ takes up a large corner of his McCrary Street shop — a space shared by numerous other player pianos, organ-pianos, and other musical oddities. A glance into the machine's inner workings reveals what is essentially a primitive pneumatic binary computer. 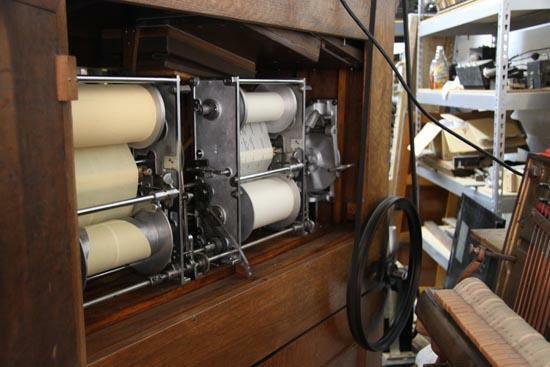 As the programmed paper rolls over a row of many tiny holes open spots trigger air pressure through different pneumatic paths, each one tied to a different instrument inside the casing. There are drums, xylophonish keys, pipes, and other noisemakers within. The machine as a whole is remarkably complex and truly exemplifies the ingenuity of the mechanical age. The songs Mr. Thornton played at the shop's Holiday Open House were tunes most of us associate with a carnival atmosphere, but amazingly rolls of other kinds of music are still in production! Mr. Thornton said he hopes to get a roll of Christmas tunes soon.